Otherwise known as the “Ally Pally”, it’s not a palace per se, but a major attraction and exhibition venue in North London. Following the Great Exhibition at the Crystal Palace in 1851, the Victorian desire for science and art exhibits grew and there was a need for another venue in North London to rival the exhibition centre in Hyde Park. In 1858, Owen Jones submitted a proposal for the next great palace to go on Muswell Hill. Two years later, the Great Northern Palace company would be established to manage the project, but it had trouble raising the initial necessary capital. Originally called “The Palace of the People” (or alternatively “The People’s Palace), it was renamed in honour of Princess Alexandra of Denmark. The Lucas Brothers, who had also built the Royal Albert Hall, were responsible for the construction beginning in 1865, but the plans had changed to a design by John Johnson and Alfred Meeson instead of the plans drawn up by Jones. Alexandra Palace was finished in 1873 and opened the same year, but a fire erupted not too long after that destroyed the building and killed three of its staff members. Not to be undone by this tragedy, it was rebuilt even bigger and better in 1875. The new Alexandra Palace included concert halls, art galleries, a museum, large theatre, lecture hall, library, and a banqueting room. The theatre included the latest stage technology to provide productions with state-of-the-art effects. The grounds amenities grew to include a swimming pool, a Japanese village, rides, a racetrack, and more. Despite all this, financial troubles for the palace continued and it closed in 1889 while 200 acres of the parkland was sold to pay off Alexandra Palace’s debts. In 1900, the owners threatened to sell the palace for redevelopment, but a group of men from the district, including Mr. Henry Burt, J.P. banded together to buy Alexandra Palace and its grounds to keep it as the People’s Palace. The same year, Parliament enacted the Alexandra Park and Palace (Public Purposes) Act 1900 to create a charitable trust to ensure the building would continue to receive funding and never fall into debt again. It then closed again for a time in 1914 due to the outbreak of World War I and parts were used by the government as a P.O.W. camp for German and Austrian soldiers. 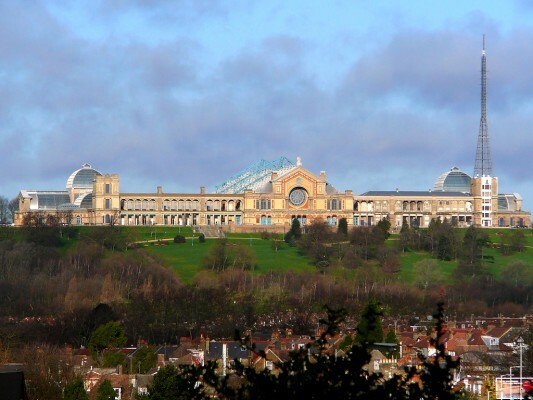 One of Alexandra Palace’s most memorable contributions to Britain and the world started in 1935 when the British Broadcasting Corporation purchased a wing of the building. It would be a year later that the first television broadcast would take place at the palace and it would continue to be used as a broadcasting centre (barring World War II) until 1956. In the mid-1950s, ownership of Alexandra Palace transferred to the Greater London Corporation, though the High Court ruled that the building and grounds were held on trust and must be used for charitable purposes. The palace ownership would transfer again to Haringey Council again in 1980, but would suffer a second devastating fire that same year. 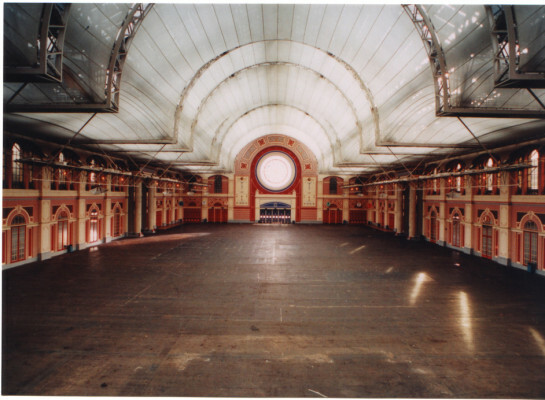 The palace’s third grand opening took place in 1988 and two years later, Alexandra Palace would receive a large ice skating rink that was available to public skaters as well as hockey teams. 1990 would also see the formation of the Alexandra Palace Television Trust which created the TV Museum on site to honour the palace’s broadcasting legacy. By 1996, the Department of National Heritage granted Alexandra Palace Grade II listed status. Moving into the 21st Century, the palace theatre say its first performances in nearly 70 years starting in 2004. While the palace’s future has yet to be written, it currently still serves as a performance venue and public place as it was originally intended to be. And since Ally Palley (which is what the locals call it) is on top of a fairly steep hill, there’s a magnificent view over the low lying land of East London, and across to the higher ground of Epping Forest and West Essex. Worth going up there just to see that. There’s a bus service up the Hill (W3 from Wood Green) and a station (Alexandra Palace) at the foot of the hill.